I wait the whole year for a few brief weeks in May. They fly by so fast, if you’re not paying attention you’ll miss it. To find the sweet spot often seems impossible, as it’s always too early and then in a blink, it’s too late. 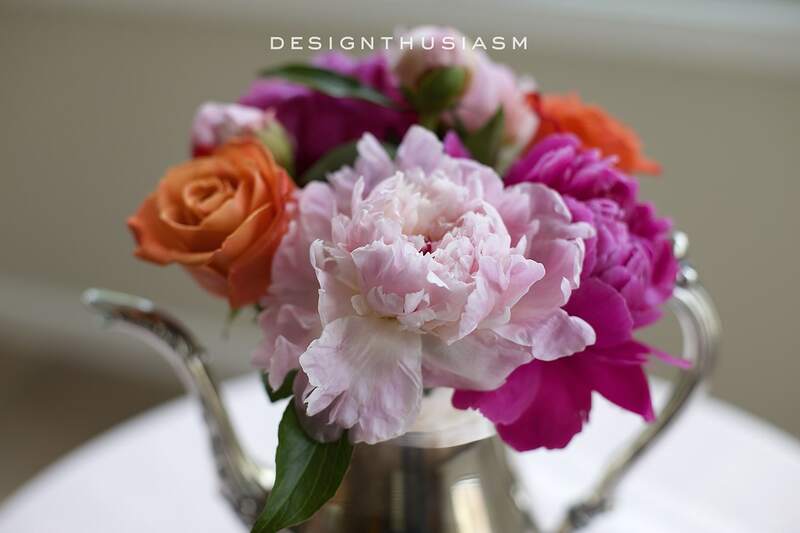 I’m talking, of course, about peony season and today I’m delighting in using them, my most favorite of May flowers for a bridal shower. The shower in question is for my niece, Alana, and I will be hosting it this weekend. Our color palette was driven by a mix of rosy pinks, inspired by the rosé wine tasting that’s the centerpiece of the event. As always, I started with a pattern and all the decor follows from there. 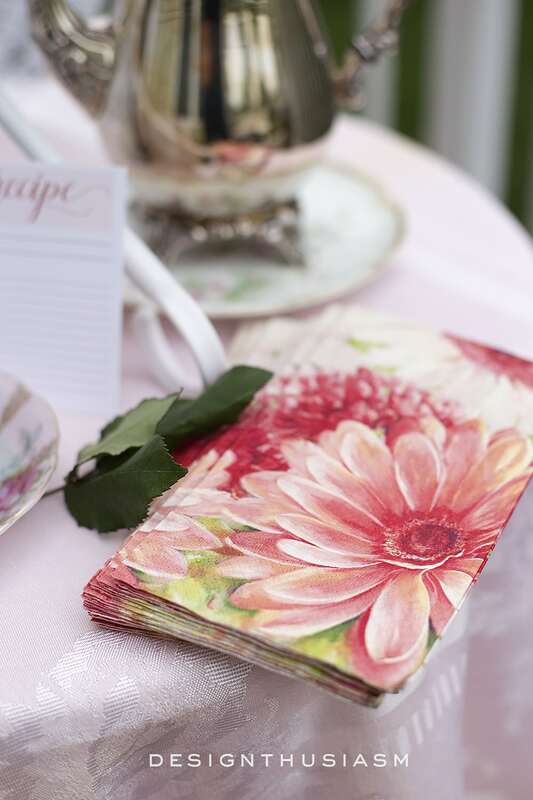 In this case it’s this lovely floral napkin that seems to well represent what we were looking for. We wanted a summer-ized version of a blush and copper palette that will be used for their fall wedding. The rosé wine then became our key color and the varied pinks in the pattern were selected to perk up the color story for the warmer season. 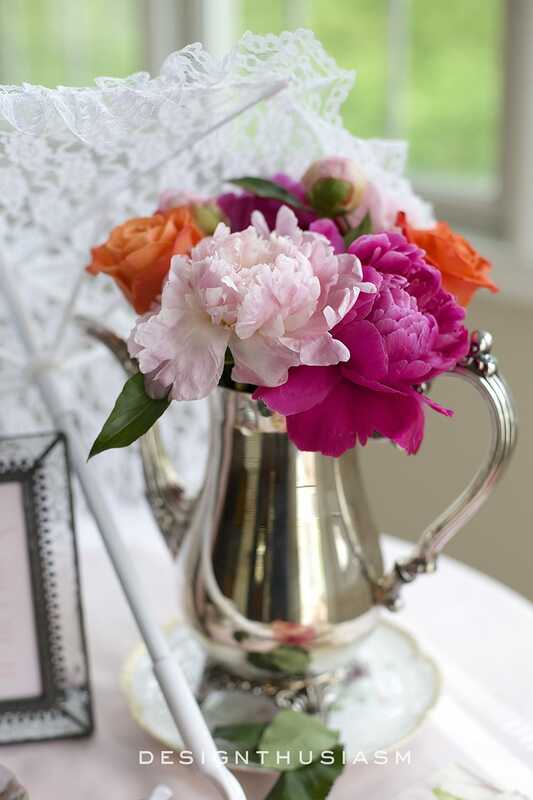 And what better flower to use for a May bridal shower than pink peonies? They are, in my mind, the most heartbreakingly beautiful flower. Lush and delicate, wispy and voluminous, and with a lovely scent as well. 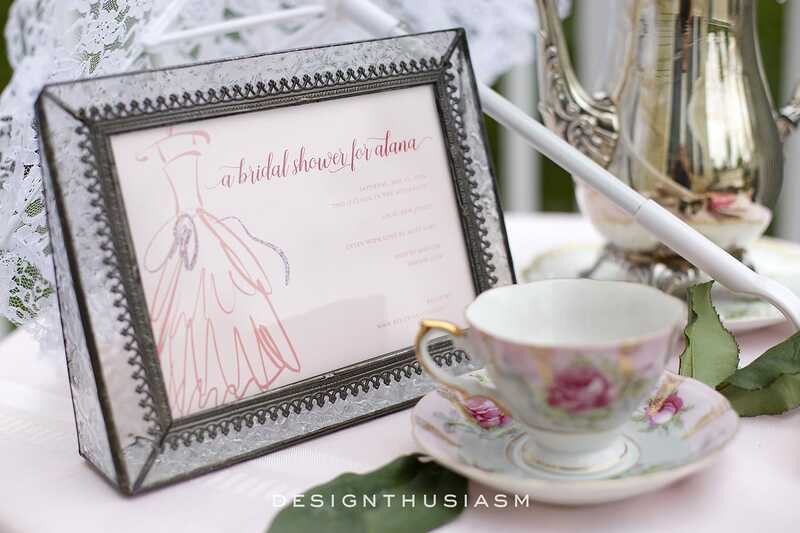 The invitation introduced our blush pink concept to the guests and will be displayed at the shower in a pretty vintage looking frame. You may recognize the script font from my new tagline on the blog, as it’s a new fave of mine that I’ve been crushing on big time. 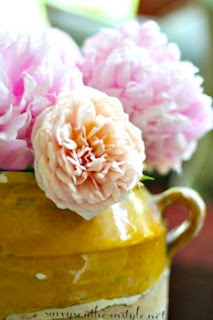 The miracle of peonies, or at least the aspect that fascinates me most, is how you can buy tightly shut buds one day, cut the stems and place them in warm water and just a day or so later they’re wide open and ready for business. 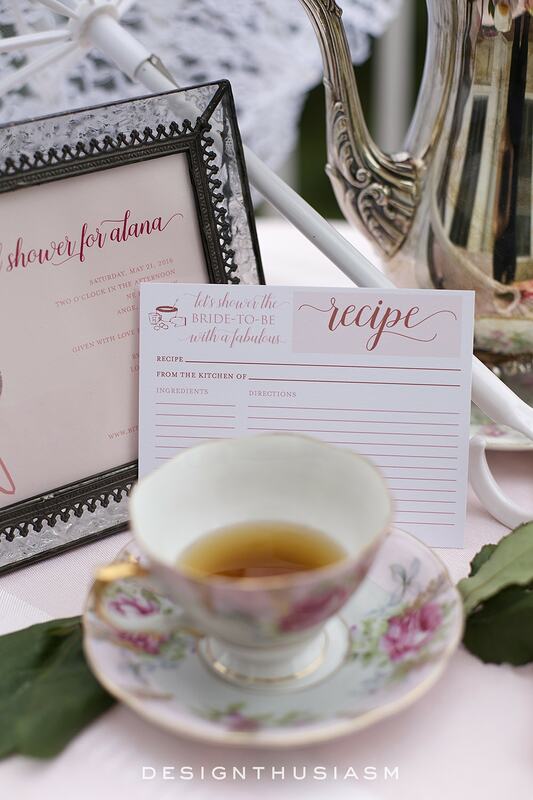 Tucked into the invitations was a recipe card I created to match the invitations, inviting the guests to share a recipe they think the bride might like. 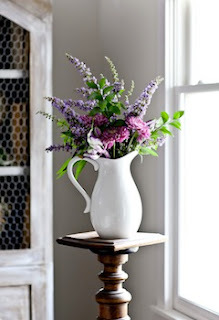 At the event there will be many more floral arrangements in various containers, but this one will be presented in this silver teapot. The orange roses were added to round out the warmer side of the palette. 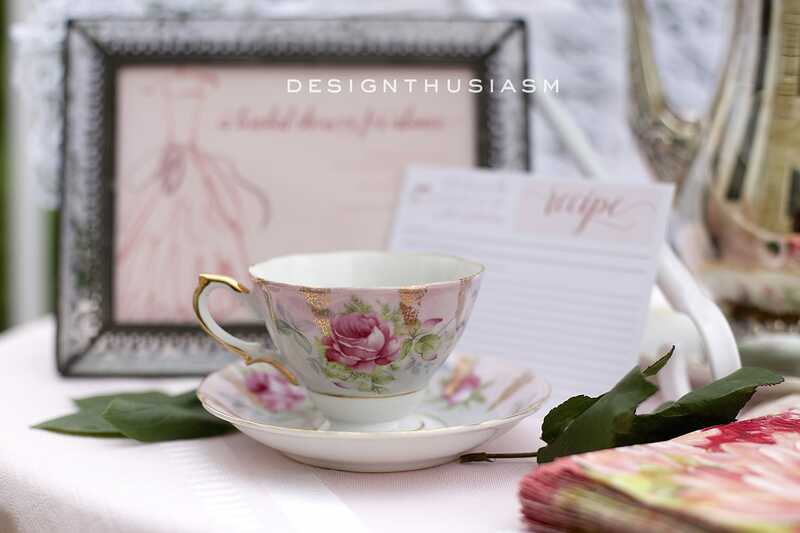 Gold detailing on the rosy pink teacup perfectly captures the aesthetic we’re striving for. 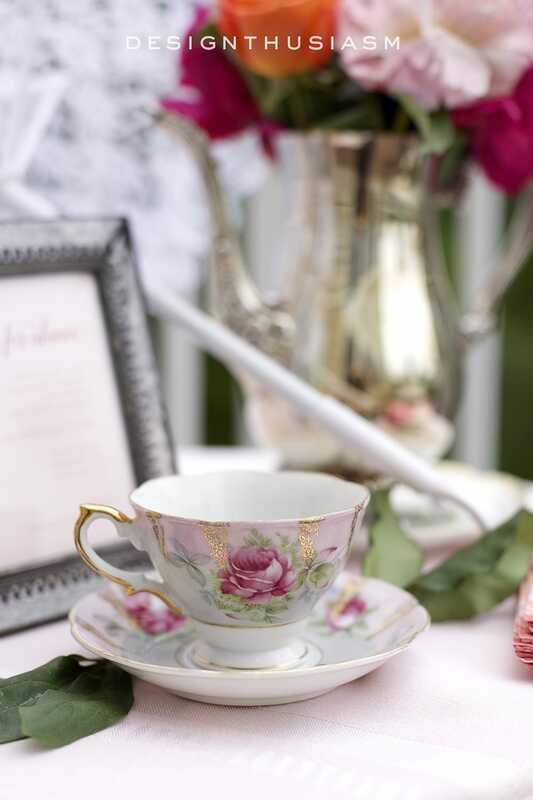 The pink gold combination, as well as the charming floral, are warm and inviting. 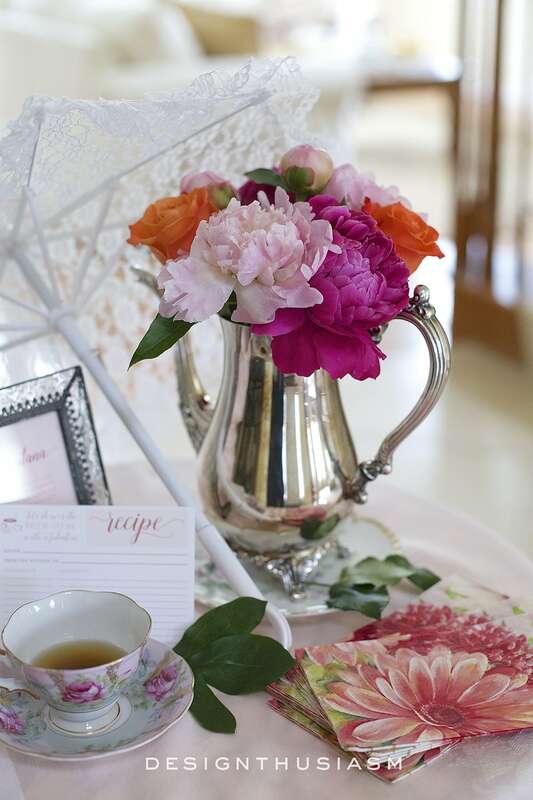 The blush pink damask tablecloth was bought at an antique market and serves as a wonderful backdrop for the stronger pinks in the arrangement. 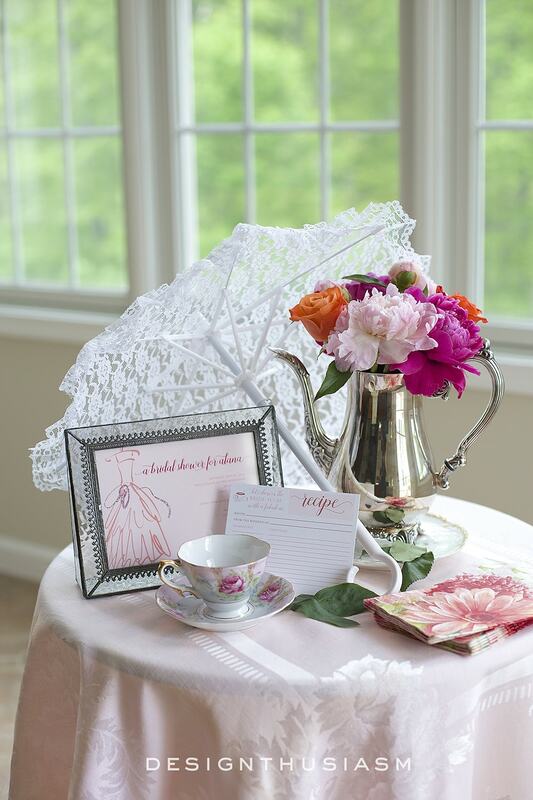 I simply had to add the lace parasol to the shower vignette. 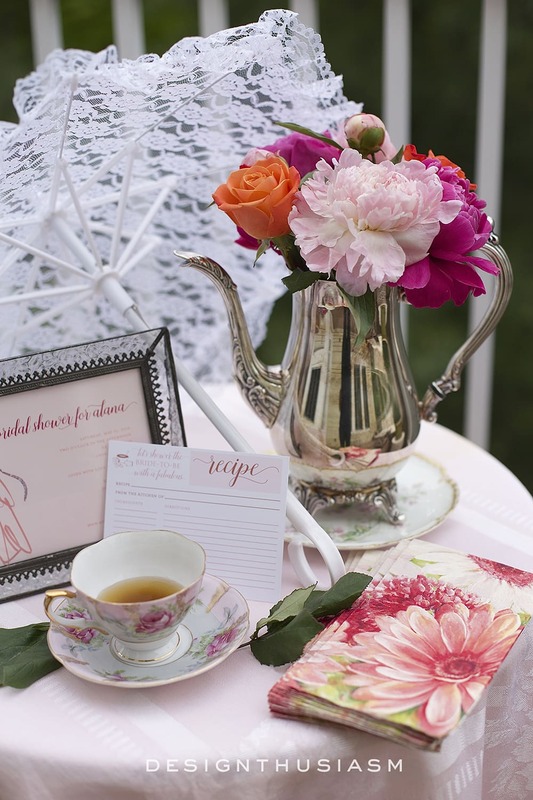 My love affair with peonies is perfectly suited for a May bridal shower. I hope to share more photos of the event and the rest of the decor next week, so stay tuned. But in the mean time, keep on scrolling because there’s more to see below. 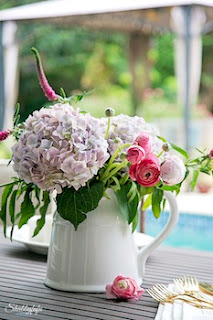 I’m linking up today with some other amazing bloggers to inspire you on how we use flowers in our homes. 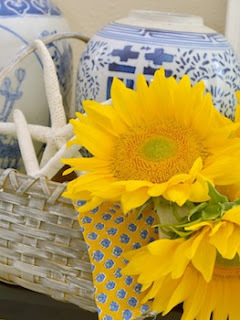 Please visit each of them linked below for a dose of inspiration! How so very beautiful Lory…I am sure your niece will love the beautiful flowers and table that you so wonderfully created for her. 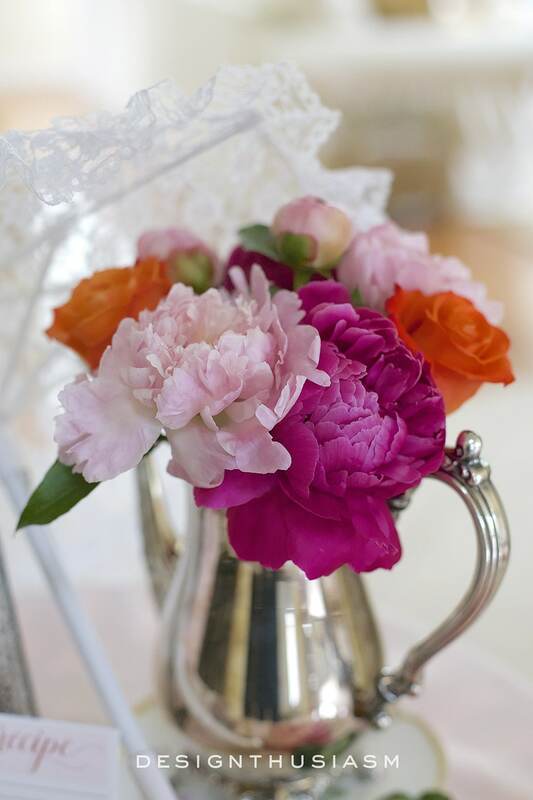 Love peonies and love that you added the orange roses….gorgeous!….Great partying with you today and have a great weekend and fabulous time at the shower! 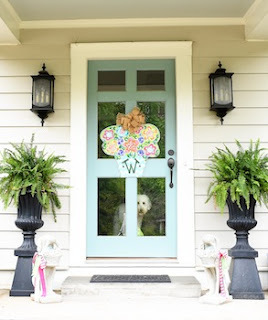 Yes, peonies need to last all summer! I love them mixed with the orange roses. Great combo! 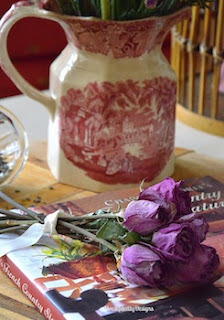 I suppose if peonies weren’t so elusive we might not appreciate them as much! Can’t wait to see more about your shower…enjoy! 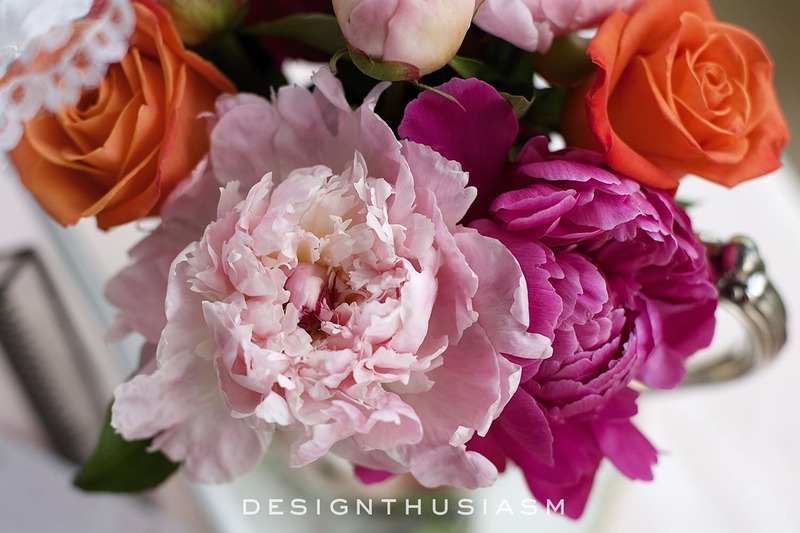 Peonies are one of my favs too, and I love your color palette of pale pink, bright pink and orange…LOVE the font too Lory! What a beautiful shower! 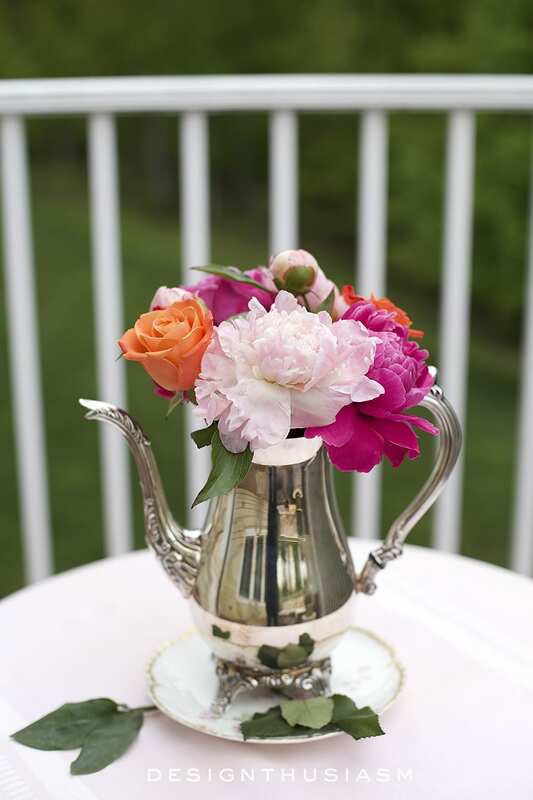 The peonies are gorgeous and I love that you put them in the silver coffee/tea pot. I love how you pulled inspiration from the napkins. Great partying with you! Just beautiful. Lory! Parasol is such a nice touch. 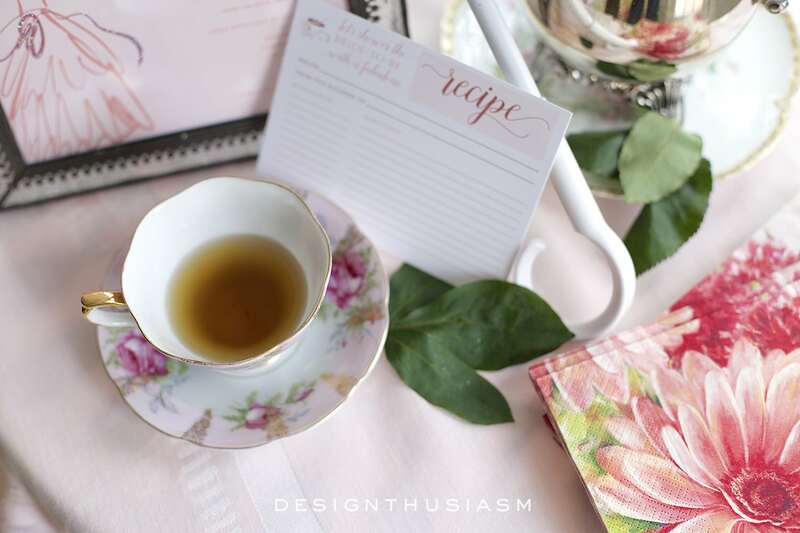 A friend introduced me to adding a favorite recipe when I gave my first bridal shower…thought that was such a great idea for new brides, especially as the ones given are already a known hit. Know Alana is very appreciative of all your efforts to ensure a lovely day.